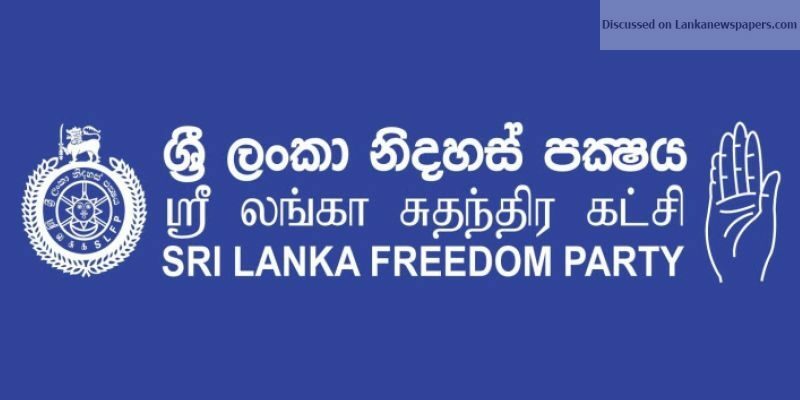 The Central Committee of the Sri Lanka Freedom Party today decided to appoint a new batch of in a bid to successfully face future elections. The SLFP Central Committee convened under the patronage of President Maithripala Sirisena today at the ‘Ape Gama’ premises in Battaramulla. Replacing Minister Duminda Dissanayake, Professor Rohana Lakshman Piyadasa has been appointed temporarily as the General Secretary of the SLFP. Minister Duminda Dissanayake was temporarily appointed as the SLFP National Organizer. President Maithripala Sirisena has been re-appointed as the Chairman of the SLFP. Several others posts were also handed on a temporary basis to seniors Sri Lanka Freedom Party members. Former Presidents Chandrika Kumaratunga and Mahinda Rajapaksa and former Prime Minister DM Jayaratne were appointed as the Advisors of the party. Parliamentarian SB Dissanayake was appointed as the Treasurer of the SLFP. Meanwhile, Minister Nimal Siripala de Silva and MPs Susil Premajayanth, John Seneviratne and Anura Priyadharshana Yapa have been appointed as Senior Vice President of the SLFP. Speaking to media after Central Committee meeting, President Maithripala Sirisena said temporary office bearers were appointed in order to launch comprehensive party’s reforms. President Sirisena said the temporary appointments will be in place for a period of 45 days adding the party reforms will be carried out during this period.